The script for Lisandro Alsonso’s latest film Jauja is reportedly only 20 pages long. Though I haven’t actually read it, that short length wouldn’t surprise me after last night’s NYFF screening. Starring Viggo Mortensen as a Danish military man stranded in a nameless South American desert, Jauja certainly isn’t your typical Main Slate festival offering. If anything, the film walks the tightrope between historical epic and surreal experiment, providing plenty of opportunity for reflection along the way. Unfortunately, the fact that the spaces in which we might take time for reflection vastly outweigh the moments that actually demand interpretation proves to be Jauja‘s downfall. The film opens with a beautiful shot of Viggo’s Captain Dinesen sitting with his daughter, Ingeborg, and right away we get a taste of Alonso’s directorial style without so much as a hint of what may betide these characters. Mortensen, the only recognizable face in Jauja (or in any of Alonso’s films), is facing away from the camera for the entirety of the motionless opening shot. That’s essentially Jauja in a nutshell: the landscape, the framing, the aesthetic, the emotion generated by the imagery alone – all of this is much more important than the actors, or the characters they play, or the “plot” they partake in. And make no mistake: Jauja, visually, is stunning. Every shot is carefully composed and lit, and the locations chosen provide Alonso’s camera with enough lush detail for consumption. Many shots seem to stretch on forever, and where most directors would probably work to keep the foreground characters in focus by blurring the backdrop, the reverse is true here. Rocks and clouds and figures far in the distance are as clear as the whiskers on Viggo’s face. Jauja‘s color palate is equally agreeable, and the blue dresses and bright red pants are captured beautifully aside the damp mossy terrain that makes up so much of the film. In this sense, we should admit, the narrative matters less and less. …but it still matters at least a little, and it’s fairly obvious that the narrative of Jauja is stretched much too thin for the runtime. As a short film Jauja might be brilliant, but the lingering camera and plodding “story” make for a really drawn-out feature. I should stop saying “plot” and “story” and just say straight-up that Jauja, basking in the obsession over imagery and visual beauty, forgets to provide anything else that might allow us full immersion into that beauty. Stunning as it is, the feeling is never “I am with Captain Dinesen on the journey” but instead “I am watching Captain Dinesen on the journey”, and the lack of connection makes it his journey but never ours. 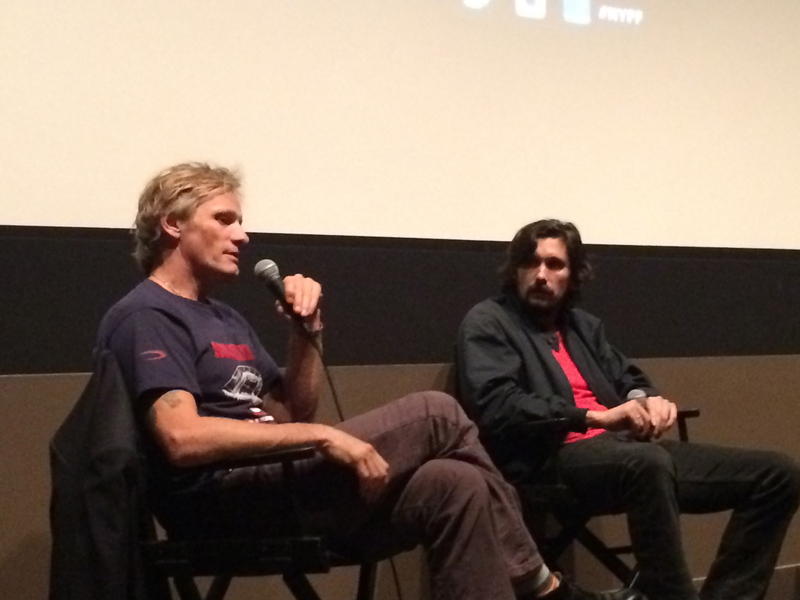 The post-screening conversation with Mortensen and Alonso – though it was cut short due to some technical issues at the beginning of the film – only offered a brief glimpse into the making of Jauja. Alonso spoke of his penchant for long shots that allow the imagery to breathe and speak, giving an example of a glass of water which, filmed for long enough, begins to raise questions as to who is drinking it. I myself am a lover of long shots and think that Alonso’s comment here is a true one – and frankly, I would have loved to look at a glass of water instead of rocks and tall grass. Frequently, a character would leave the frame and the camera would remain, waiting, lingering on this empty landscape, and then…cut. Perhaps we should have wondered what other men would stagger across this barren wasteland. The last fifteen minutes of the film are, in the words of the NYFF moderator, a “leap”. He’s right, and Mr. Mortensen was right in stating that these fifteen minutes are what sticks with you, “dragging the rest of the film along with them”, and whether you were impressed or bored by that ending it certainly does stick in your head. Jauja is very much about the journey rather than the destination, the question rather than the answer, and it’s also more concerned with letting the visuals speak for themselves than with trimming the fat. But it’s hard to ignore the creeping feeling that a leaner Jauja would be a better Jauja, and that a little more content would have made the beauty of the form shine much brighter.